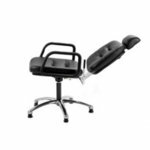 Direct Salon Supplies Palma gas lift reclining back wash chair on 5 Star base (5 Star base has adjustable glides to allow adjustment for uneven floors). Available with non-rotating gas lift or rotating gas lift. The Palma is a fully reclining back wash chair with smooth action ideal for care homes, with deep cushioned seat and back for real comfort in the recline position. Adjustable and removable head rest as an option(please use the drop down box to choose this option). The Gas back angle recline mechanism is lever operated and has a infinite lock. The side lever allows the stylist to adjust and lock the back in any desired position to help with elderly people with different mobility needs. 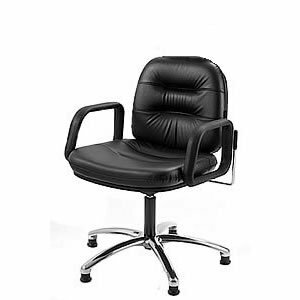 The Palma has an anti- shock release and recline which returns the back to the upright sitting position very smoothly. Available in Black or White upholstery(please use the drop down box to choose). Sizes: Width 63cm, Depth 63cm, Height 110-140cm with head rest. Please click on picture for more images of this chair.